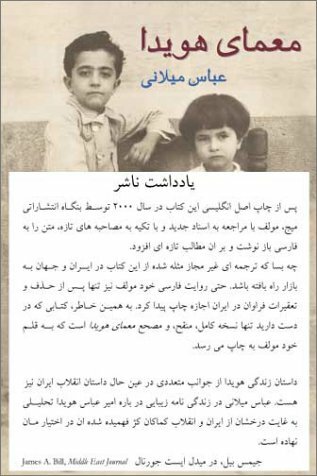 This is a revised and updated Persian edition of The Persian Sphinx originally published in June 2000. Amir Abbas Hoveyda embodied the aspirations, the accomplishments and also the failures of a whole generation of Iranian technocrats -- mostly Western-trained -- who sought to free Iran from the travails of poverty and repression and guide it into the modern age. Hoveyda would be both a leader and a victim of that effort. On the eve of the Islamic Revolution, the shah, attempting to turn the rising tide of revolt by offering a scapegoat, ordered the prime minister's arrest. When the Pahlavi regime fell, Hoveyda chose not to flee, voluntarily surrendering to the new Islamic authorities. His hope was for a public trial; instead the infamous "Hanging Judge" presided over a secret and summary trial. In telling the story of Hoveyda's life, the author has not only laid bare the development of Iranian society during a pivotal period (19191978) but has also unearthed important new material on U.S.-Iranian relations. From 1957 onward, Amir Abbas Hoveyda played critical roles in dealing with U.S. foreign policy and fundamentalist Islamic opposition in Iran. Through careful use of hitherto-unexamined archival materials, unpublished letters, and personal journals, along with extensive interviews with more than a hundred of Hoveyda's relatives, friends, and foes, the author has brilliantly caught the pathos and passion of Hoveyda's life and times. If you have any questions about this product by Mage Pub, contact us by completing and submitting the form below. If you are looking for a specif part number, please include it with your message.